Masshole Sports: The Patriots Have Signed Tim Tebow. I Repeat, The Patriots Have Signed Tim Tebow. My Friggin Head Is Spinning Right Now. The Patriots Have Signed Tim Tebow. 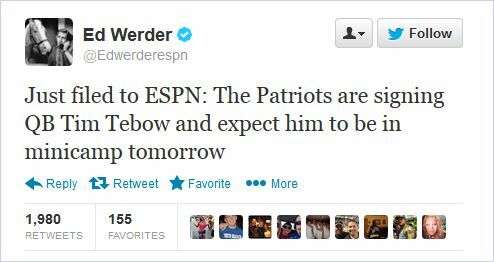 I Repeat, The Patriots Have Signed Tim Tebow. My Friggin Head Is Spinning Right Now. I cant even process this right now.